Houston Car Accident Lawyers > Articles > Auto Accidents > Motorcycles Are Just Plain Dangerous? Motorcycles Are Just Plain Dangerous? The real problem is that nobody in Houston is watching where they are going. You have drivers out there with their head stuck in their iPhone instead of paying attention to the road…and motorcycle riders don’t stand a chance under those conditions. If you got hit by a negligent driver in Texas, then give us a call (832) 463-1003. Nothing beckons the open road like a motorcycle. In a recent driving vacation, with family in tow, I reminisced about the freedom of hopping on a hog and taking off – wind blowing by you. But motorcycles may very well be the most dangerous vehicle on the road. Here is why. As recently as 2016 approximately 4,935 people were killed in all types of accidents. Approximately three-fourths of these motorcycle accidents involved collision with another vehicle, which was most usually a passenger automobile. 4. In the single vehicle accidents, motorcycle rider error was present as the accident precipitating factor in about two-thirds of the cases, with the typical error being a slide out and falls due to over braking or running wide on a curve due to excess speed or under-cornering. Drive safely – no matter what type of vehicle you take onto the road. 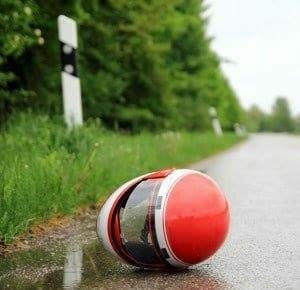 A study by NHTSA regarding motorcycle accidents provided the following insight into injury causation and prevent-ability of motorcycle crashes. The single largest factor in motorcycle accidents is that the automobile driver fails to detect or see the motorcycle in traffic. The lack of awareness that a motorcycle driver is even there combined with a lack of caution and awareness by the automobile driver is the leading cause of motorcycle accidents. Without a doubt, injury severity goes up radically with increased speed. The higher the speed at which a motorcycle crashes the much greater potential for serious injury or wrongful death. The lack of helmets accounts for the most severe injuries that are preventable. In Texas we have no mandatory helmet use by motorcycle riders. The motorcycle safety training appears to provide effective ways to reduce the number of severe motorcycle accidents. The more training a motorcycle rider has the less likely he or she will be involved in an accident. The use of a helmet would further reduce the severe head injuries associated with many motorcycle accidents.